Another funny name, but no mistake about it, the Big Green Egg grill is the real deal! This smoker grill is one of my favorite barbecues on the market. It may be a bit more expensive than other entry level, and very solid, grills like the Weber kettle grills, but this is really the pinnacle of charcoal grilling, in my opinion, and arguably the best outdoor grill on the market in terms of flavor and versatility. So what is the Big Green Egg grill anyway and why is it so great? Porcelain Glazed Ceramic Construction - The Big Green Egg is made of an advanced ceramic material. 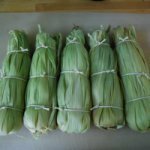 It is perfect for retaining moisture and heat within the grill. This means it is the most efficient, precise and best grill on the market! This is because it has amazing temperature control and keeps the moisture in your food for super succulent grilled or smoked meats. Most grills with thin metal walls don't retain heat well and dry your food out. Precise Temperature Control - Because of the great temperature retention of the ceramic walls of the grill, your charcoal fuel can be kept at just the right temperature for whatever your cooking style or recipe. By varying the opening of the fire dampers (one at the bottom by the charcoal and one on the lid) you have precise control of temperature to within a few degrees! Really, its hard to believe but you can turn the temperature up and down as easily as in your stove in your kitchen! Everything from super high heat for searing, down to low temperatures (around 150 degrees) for slow cooking and smoking. I don't know of any other grills on the market which can boast this versatility and precise control. Another advantage of the incredible heat retention and efficiency of this grill is that you need less charcoal to attain the same temperature compared to other grills. This means less money spent on expensive lump hardwood charcoal and more on your food ingredients! Also, because you can precisely control how hot and fast your charcoal burns by using the fire dampers and metal top, your charcoal burns less wastefully. This means that when you are done cooking, you can close the top and fire damper and your coals will extinguish! Simply shake off the ashes next time you cook and you can re-use part of your charcoal! This will save you money on charcoal as well. Smoker and Grill - Like most barbecues, the Big Green Egg can be used both as a smoker and a grill. However, most do not do both so well. You either have a smoker which is ideal for smoking meats or a grill which is great at higher heats. Rarely do you find one outdoor cooking utensil which is this versatile and can do both so adeptly. Easy to Start - Because of its recessed and entirely contained shape, the Big Green Egg acts like chimney, intensifying and retaining heat perfectly. It protects your charcoal from wind and the elements while helping it ignite so that it will be ready to cook in minutes. Safe - Because of its unique ceramic walls and the porcelain-glazed outer coat, the surface of the Big Green Egg stays relatively cool, even when it is hot inside. So this grill is safer around children and pets than metal grills which get very hot on the outside as well. Natural Flavors, No Metal - Some people don't like metal grills because they can impart a slightly metallic taste to your food. It may be subtle, but it can be there, especially in grills that have not been seasoned appropriately. This ceramic grill needs no special seasoning and imparts no metal or other flavors to your food, just the natural flavors of your ingredients and the wood smoke you choose to cook with. Several Sizes - The Big Green Egg smoker grill is available in four sizes, the large (18-1/4" grill grate), Medium (15" grill grate), Small (13" grill grate) and Mini (9-1/2" grill grate). All operate the same way and are made of the same materials. So simply pick the size that is best for you, your family and your entertaining style. 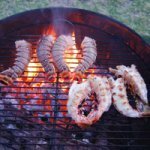 Accessories ('EGG'-cessories) - There are too many great accessories for the Big Green Egg to mention all here. Some of the important ones? The Egg Nest is a custom made carrier which holds your egg safely and at the right height for cooking. It has folding side tables and wheels to easily maneuver your grill around the back yard. The egg also has a special precise temperature gauge which goes from 50 to 750 degrees F. The dual function metal top give you the precision of control to accurately dial in your perfect grilling or smoking temperature. You can also buy ash sweeping tools, electric charcoal lighters, grill grate grippers and special roasting racks and baskets specifically made just for the Big Green Egg. Finally, to protect your investment, you need a custom vinyl cover to cover your egg while not in use. The Big Green Egg grill is one of the very best charcoal grills and smokers on the market, maybe even the very best! Why? Its advanced construction with ceramics makes it more insulated and heat retaining, and thus more efficient with very precise temperature control across the whole range of cooking temperatures, from lower for slow cooking and smoking, to high temperatures for searing. The construction also retains moisture, so your food doesn't dry out and stays succulent and juicy. Yes, it is a bit more expensive than most charcoal grills. But when it comes to perfectly grilled or smoked food, money is no object in my opinion. You will never regret buying a Big Green Egg smoker grill. SpitJack - Tools for Food & Fire! Specializing in fireplace grills, rotisseries, other fireplace cooking accessories and outdoor spit cooking. Also a great selection of fire pits, grills, smokers, firewood storage. While they do not carry the Big Green Egg grill, they do carry two other excellent ceramic grill brands, the Primo and the Kamado Joe. 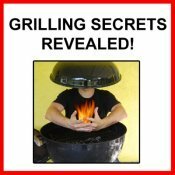 Done learning about the Big Green Egg Smoker Grill? 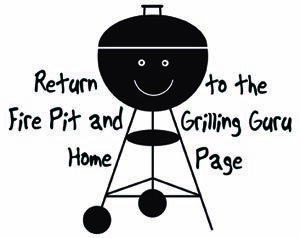 Go back to the Outdoor Grill page.